Panther is an almost 1 1/2 year stunning black and white female born April 25, 2017. Her sire is Djays Octane, and her dam is RCK Pandora. 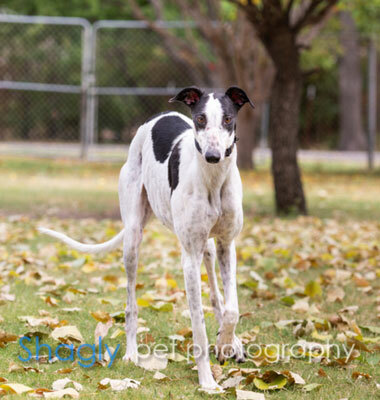 Panther did not show promise of establishing a racing career, so here she is looking for her forever home! It is not known at this time if Panther is small animal or cat tolerant. Panther is a sweet black and white cow-dog born in June, 2017, and is still very much a puppy. We have taken to calling her Panther Lily (like tiger lily) because she is not panther-like at all. She is active, needs canine companions and a yard to play in. She lives with my Chihuahua and has never taken a second glance at him, accepting him as a dog and a member of her pack. She also lives with a senior female, Big Boss, a middle-aged but active female and a young male. She gets along with all of them, deferentially accepting correction from Big Boss and playing happily with the younger dogs. She visited a cat recently, play bowing and wagging in front of the gate that separated them, but quickly lost interest as the cat glared back at her. She has not been officially cat tested. Panther decided racing school was not her thing, though she spent enough time in training to arrive fully housebroken, playing well with others and eager to please her humans. She has never had an accident and learned how to use the doggie door within 10 minutes of arrival. Panther is eager for affection and treats and will joyously plow into the pack, shoving the other hounds aside so she can get all the loving. For this reason, I feed her in her crate so the rest of the hounds can eat in peace. Panther enjoys walks and car rides. She is smart and learns new things quickly and is progressing well on the leash. She is highly motivated by affection and food, so I believe she should be taught a fun hobby, such as agility. 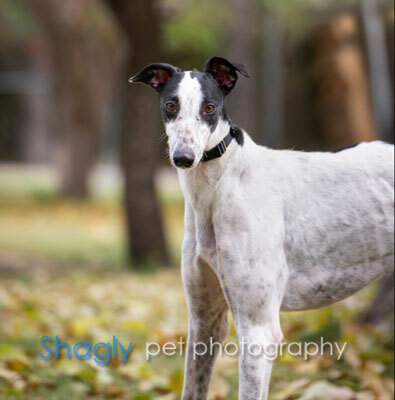 If you have other dogs, a yard and an extra dog bed…Panther would love to join your pack.